How do you make the drinking session that usually highlights your friend's birthday shindig truly unforgettable? By whipping up tangy, mouth-watering beer match bites, of course. 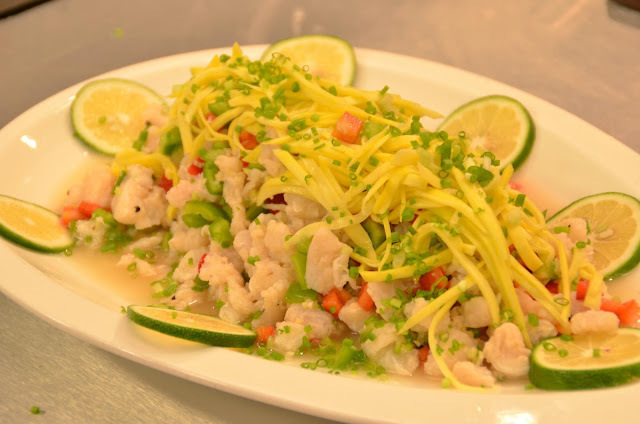 Like, Chef Boy strongly recommends Dory Kinilaw. Yes, this is the delectable Filipino response to Japanese sashimi and Italian ceviche! 1. Sprinkle the fish fillet with ½ teaspoon of fine salt and ¼ teaspoon of black peppercorn. 2. To season the fish evenly, repeat the process on the other side of the fish fillet with the remaining salt and peppercorn. 3. Add Datu Puti Vinegar, calamansi, garlic, onion, ginger and sili. 4. Marinate in the refrigerator for one hour. 5. Garnish with spring onion, red and green bell pepper cubes and green mango strips. 6. Finish seasoning with Datu Puti Fish Sauce.